3/12 from the 1995 Treasure Hunt series. The Camaro has white paint with orange stripes on the hood and trunk. It has clear windows, an orange interior, Real Rider wheels with Goodyear tires, and an unpainted metal Malaysia base. 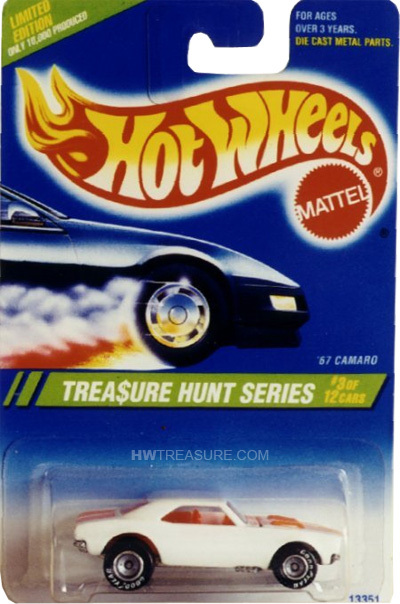 The Camaro debuted in the The Hot Ones series in 1983 and is based upon the actual vehicle. 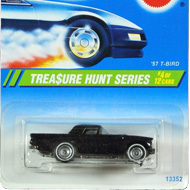 This iconic car has also made an appearance as a T-Hunt in 2005 and as a Super T-Hunt in 2013. 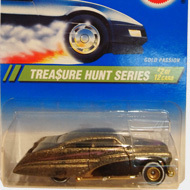 The 1995 edition remains one of the most expensive and desirable of all Treasure Hunts.